GROW, CREATE, LEAD THE WAY GATOR! The Art Club provides students the opportunity for an artistic outlet. The club meets to complete many different types of art including: painting, pottery, photography, and drawing. The Book Club exists as a place for students to read, interact, and discuss books on a inter-grade level. Included in the many recent reads are Skeletons at the Feast, The Tenth Circle, and The Perks of Being a Wallflower. Reach out to the community by volunteering your time at Project Hospitality, Habitat for Humanity, Silver Lake Nursing Home and more. Be the change that you wish to see in the world! Forensics provides students with the opportunity to practice their research, speech writing and public speaking skills. Team members compete locally and nationally in the National Forensic League and in the Nation Catholic Forensic League. Students also attend university-sponsored competitions at Princeton, Columbia, Yale, Harvard and St. Joseph’s University. The opportunity to practice is offered several times a week, and competitions are weekly when the season begins. Notre Dame Academy has proudly sent several students all the way to Nationals for the past several years. The French Club ensures that the school remembers its French roots while imparting valuable international knowledge to students. 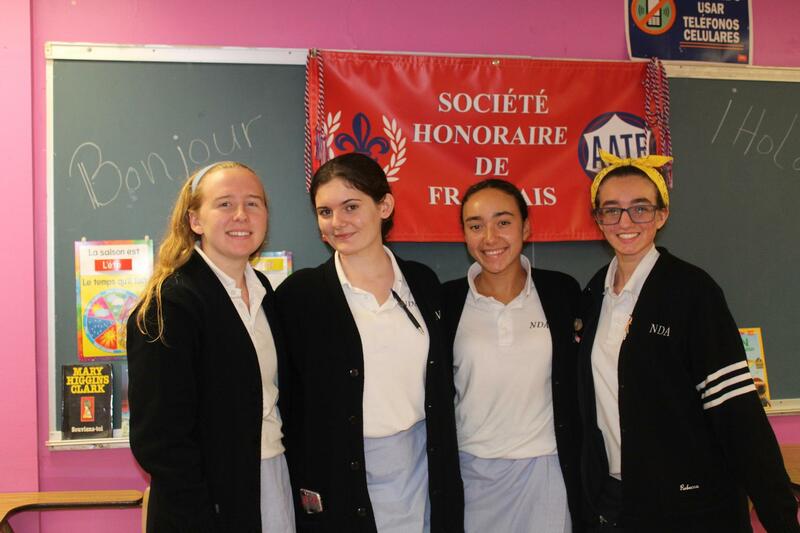 The club has connections with the French Embassy, celebrates French Week, and collaborates with Notre Data on the French section. C'est magnifique! The Spanish Club celebrates Spanish culture and heritage with authentic Spanish food, celebrations, and other activities. The Afro Caribbean Club celebrates African and Caribbean cultures through traditional song, dance, food and celebrations. Good Morning Gators! is an student-produced news show. The show has various segments including: morning announcements, prayer, school sports, school birthdays, and the word of the day. Interact members work to become a generation of leaders to serve others. The club provides service, helps those who are in need of aid, and volunteers in the community. Leadership, character, scholarship, and service are the four characteristics of the National Honor Society. NHS members work in a variety of ways including peer tutoring and charity fundraising. The staff of Nostra, the school yearbook, works continuously to capture and compile the past and present. Their publication becomes the memory of a class and is distributed to be forever cherished by all students. Glamour Gals provide time, attention, and fun to our local nursing home residents. Students and residents bond over their shared love of all things glamorous! Notre Data, the school newspaper, is published quarterly by a team of student reporters. The newspaper coverage includes school sports, editorials, reports, mind teasers, and cartoons. The Student Government is the representative assembly of the student body. Members are elected for one-year terms and work to represent the interests and needs of the student body and off-campus community through many school spirit and charity events. The Video Yearbook members work all year to create a video yearbook which brings the best and most significant events in the school year back to life for student's entertainment. The Baking Club members bake up tasty treats in the school kitchen for our local nursing home, Project Hospitality and, of course, our students! Our Health Club meets at the center of our Campus to grow and cultivate herbs, vegetables, fruits and more. Featured on NY1 as “Staten Islanders of the Week” for their outstanding work on our community garden, the Health Club harvests its own produce to donate to Project Hospitality and other charitable organizations. Green Angels centers on all aspects of environmentalism. Conservation, recycling and upcycling are all a part of their plan to make NDA more environmentally conscious. Go Green! Students develop (pun intended!) digital photography skills through hands-on learning and create art out of real life images. Math Club fosters a love of math and problem solving. Students are given complex problems to solve in a fun and engaging setting. Science Club members meet to experiment and problem solve. Learn to make lava lamps, snow globes and more! Members express themselves through poetry and short essays in Creative Writing Club. Students develop empathy as they learn about and foster awareness of animal rights issues. All students are welcome to join this supportive environment of peers and role models and learn to see themselves as computer scientists. Beyond the club, girls can tap into an alumnae network of tens of thousands of girls across the country who are using computer science to solve problems they care about. Engineering Club provides an opportunity to try hands-on experiments after school to enhance students' exposure to and understanding of engineering as a possible college major. Generous support is provided through Engineering Tomorrow, a non-profit committed to bolstering the number of US students entering the field of engineering in order to continue our country's leadership and innovation in problem-solving at the highest levels.